Last November 23, 2009 in the town of Ampatuan in Maguindanao province, Mindanao a brutal carnage transpired which eventually was referred to as the Maguindanao massacre. 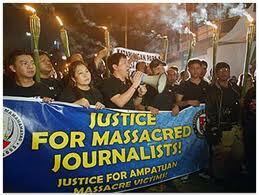 58 people perished in the bloodbath, 34 of them are journalists. According to the Committee to Protect Journalists (CPJ), the incident has been referred to as the single deadliest event for journalist in the annals of history. Several people were indicted for the gruesome crime. The Ampatuans were held as principal in the case. They include former Maguindanao governor Andal Ampatuan St., his son former Autonomous Region in Muslim Mindanao (ARMM) governor Zaldy Ampatuan, former Datu Unsay mayor Andal Ampatuan Jr., former Shariff Aguak mayor Datu Anwar Ampatuan, for vice governor Datu Sajid Ampatuan and former Mamasapano mayor Akmad Ampatuan . The case became a celebrated legal battle with the Ampatuans on the defense and several complainants on the other. 4 years have gone by. Hundreds of witnesses were also named and required to be given a day in court for their statements. Court trial is regularly held and scheduled accordingly. Seasoned lawyers claim while assessing the progress of the litigation that it would take a number of years before the case would be rested for decision. This is because of procedures. A witness may be called on the stand, required to identify and provide testimony for a period or for a number of dates on end, and thereafter to be cross examined, presented anew and re-crossed. One witness may stretch the period of hearing for months in a tentative manner and several witnesses are still on board to undergo the same judicial procedure in the forthcoming session. This would take time. As each counsel would take pains in reviewing minutely the proceedings, responding to each through motions and other technical actions, the process would grind exceedingly slow. Meanwhile, a number of complainants, encountering difficulties to move on, have to struggle to survive without their kinsmen, the breadwinner, the victim in the crime. Yet they have a responsibility to pursue, a role to play, an act to follow. They must be at the forefront of a crusade to bring the malefactors to answer for the offense they have committed. It is however easier said than done. On their own, the quest for Justice, an obligation of the State through its judicial system, is stiff and demanding. That should explain why, it has been reported by private prosecutor Harry Roque, that relatives of media victims in the case have agreed to negotiate for a settlement with those indicted. Here is a situation when the courts would try a case where all charges and evidences are lumped, compiled, organized in a manner that would sufficiently point at the proper guilt as it get entangled into a maze of criss-crossing complaints. Why not try one case at a time. Complete one case and make a decision based on what is presented and heard. Then to be followed by another, so on and so forth. If a case has been completed, the rest remains pending subject for succeeding trials. The point there is that a case is done in an instant. It could be a conviction or an acquittal depending on how the case is submitted, defended and weighed. This is to be fair to the victims and those who are awaiting the verdict on their situation. Four years of trial is long for the completion of a case. For the prosecutors and defenders, the fulfillment of justice is immediately known. For the courts and the judicial system, it is the accomplishment of an evenhanded duty. Stretching the trial on great lengths while it is an ideal process to determine the truth, at times would render the entire exercise into a mockery. Complainants would become weary, witnesses will be drained and exhausted, testimonies become stale and overlooked, evidences become trite and would lose its potency. Court officers, some of them may cross over and would retire, others replaced if not suspended, and a number may shift and fade away. Politics would eat away interest, economics would gnaw at the marrow of significance and time would eventually consign every substantial matter into triviality. After a calibrated duration, a decision will eventually be made and as it drags on and on, it might virtually end up nowhere in time. The cold steel bar is just in the lurk somewhere and it might become brittle as a result of rust! Posted on June 25, 2013, in Uncategorized and tagged criminal justice system, Litigation procedures, Maguindanao Massacre, prison system, The Judiciary. Bookmark the permalink. 2 Comments.